Illustration of the genetic editing techniques used to create a pig model of Huntington's disease. The alteration is referred to a “knock in” because the changed gene is in its natural context. A pig model of the neurodegenerative disease, with similar manifestations to humans, could be an opportunity to test treatments such as CRISPR-Cas9 gene editing in larger animals before clinical applications. Using genetic engineering technology, a team of scientists has established a pig model of Huntington's disease (HD), an inherited neurodegenerative disease. The researchers anticipate that the pigs could be a practical way to test treatments for HD, which is caused by a gene encoding a toxic protein that causes brain cells to die. The research was published online in Cell on March 29th. The pig HD model is an example that suggests large animal models could better model other neurodegenerative diseases, such as Alzheimer's, Parkinson's and ALS (amyotrophic lateral sclerosis), he says. A HD pig could be an opportunity to test if CRISPR-Cas9 gene editing can work in larger animals before clinical applications in humans. "We think the pig model will fill an important gap," says co-senior author Shihua Li, M.D, professor of human genetics at Emory University School of Medicine. "In pigs, the pattern of neurodegeneration is almost the same as in humans, and there have been several treatments tested in mouse models that didn't translate to human." Shihua and Xiao-Jiang Li jointly run a lab at Emory, which collaborated with Liangxue Lai, PhD, associate director of the South China Institute of Stem Cells and Regeneration Medicine, Chinese Academy of Sciences. The lead author of the paper is Sen Yan at Jinan University's Guangdong-Hongkong-Macau Institute of CNS Regeneration. Yan was trained in the Li Lab as a visiting PhD student at Emory. The pigs are housed in Guangzhou. Researchers used the CRISPR/Cas9 gene editing technique to introduce a segment of a human gene causing Huntington's, with a very long glutamine repeat region, into pig fibroblast cells. Then somatic cell nuclear transfer generated pig embryos carrying this genetic alteration. The alteration is referred to a "knock in" because the changed gene is in its natural context. 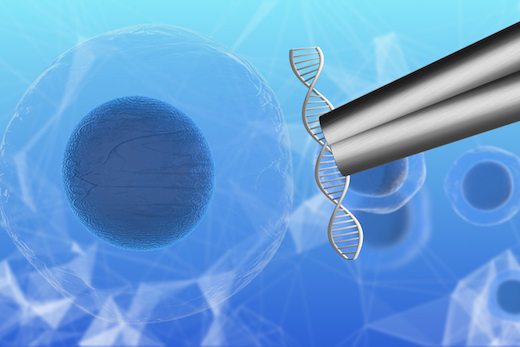 Last year, the Li lab published a paper in Journal of Clinical Investigation showing that CRISPR-Cas9 gene editing, delivered by viral vector, can reverse signs of HD in a mouse model. Working with Liangxue Lai, the Li lab has generated transgenic -- not "knock-in" -- pigs that are models for HD. The Li lab also collaborated with Anthony Chan, DVM, PhD at Yerkes National Primate Research Center to generate a transgenic HD monkey model.